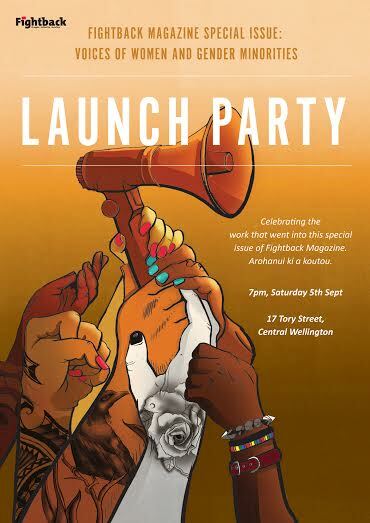 Earlier this year, Fightback put out a call for women and gender minorities to submit art/poetry/articles around the themes of socialism, feminism, anti-capitalism and decolonisation, after we recognised a lack of writers in this area of the socialist press. We had 89 awesome supporters pledge donations of a total of $2670 (!!!) that we split completely between all of our contributors – writers, artists, poets, designers, editor and sub-editors. We wanted to not only provide a platform for voices rarely published, but also give back in practical terms, so we have the fuel to keep writing, creating and organising against capitalism, colonisation, patriarchy and all intersecting oppressions. We warmly invite you to join in celebrating the work of our contributions for the issue of Fightback: Voices of Women and Gender Minorities. Hard copies will be available for sale at $5 each. There will be limited copies, so be in quick! Free entry, koha welcome. Light kai and drinks provided. Accessibility: Street-level premises with a large step. The bathrooms are upstairs, but have elevator access.